The 2018 UNGA session was the first time that El Salvador, Liechtenstein, Nepal, Thailand, and Tunisia had spoken on killer robots, bringing to 90 the number of countries that have commented on this topic since 2013. Tunisia found that autonomous weapons must be regulated before they are used, while El Salvador proposed a legally binding instrument to ensure human control of weapons systems. Nepal raised serious ethical and moral questions and called for “a sound regulatory framework.” Thailand highlighted the importance of respecting and “evolving” international humanitarian law. Many states stressed the importance of retaining human control over weapon systems and the use of force, particularly Austria, Brazil, Bulgaria, Chile, El Salvador, Germany, Ireland, Italy, Japan, Portugal, Slovenia, and Switzerland. Ireland found that autonomous weapons systems pose “considerable moral, legal and ethical dilemmas” and expressed its “firm belief that such weapons must always remain under meaningful human control.” A handful of European states (Italy, Portugal, and Switzerland) expressed interest in pursuing a political declaration on human control, as proposed by France and Germany, which the campaign views as insufficient to respond effectively to the multiple challenges raised by fully autonomous weapons. Austria and the Campaign to Stop Killer Robots convened a UNGA side event on 17 October featuring presentations by the Arms Control Association, International Committee for Robot Arms Control (ICRAC), and Project Ploughshares (Canada). Several state representatives attended, including from Brazil, Ecuador, France, New Zealand, and Portugal. The next day ICRAC’s Peter Asaro delivered the campaign’s statement to UNGA First Committee that called on “responsible governments to act promptly and pursue multilateral negotiations on a new ban treaty.” The campaign said it expects “nothing less” than a treaty to retain meaningful human control over weapons systems and the use of force and stands ready to cooperate with states and others keen to achieve this goal. During UNGA First Committee, campaigners met with diplomatic representatives from Algeria, Armenia, Austria, Belarus, Cameroon, Egypt, Kazakhstan, Kyrgyzstan, Liechtenstein, New Zealand, South Korea, Russia, Tajikistan, Ukraine and other states. Campaign coordinator Mary Wareham of Human Rights Watch participated in a civil society consultation with UN disarmament chief Izumi Nakamitsu on 11 October and contributed a chapter on behalf of the campaign for the WILPF Reaching Critical Will’s annual First Committee Briefing Book as well as articles for the First Committee Monitor. The Campaign to Stop Killer Robots participated in the seventh annual Humanitarian Disarmament Forum gathering of activists. It held a visual stunt outside UN headquarters, producing striking stock photographs and video footage of campaigners dressed in anonymous, white disposable boiler suits and red bandanas. * According to the campaign’s count, 34 states raised killer robots at UNGA in 2017, 36 did so in 2016, 32 in 2015, 23 in 2014, and 16 in 2013. At the 2018 session of UNGA First Committee on Disarmament and International Security, at least 49 countries raised killer robots in their remarks: Algeria, Argentina, Australia, Austria, Bangladesh, Belgium, Botswana, Brazil, Bulgaria, Canada, Chile, China, Costa Rica, Cuba, Ecuador, Egypt, El Salvador, Estonia, Finland, France, Germany, Guatemala, India, Ireland, Israel, Italy, Japan, Kazakhstan, Liechtenstein, Mexico, Nepal, Netherlands, New Zealand, Pakistan, Peru, Poland, Portugal, Republic of Korea, Russia, Slovenia, South Africa, Spain, Sweden, Switzerland, Thailand, Tunisia, Turkey, United Kingdom, and United States. Several states raised killer robots concerns at least twice in various statements, especially under conventional weapons. Five groups of states also included killer robots in their remarks: Arab Group, European Union, Non-Aligned Movement (delivered by Indonesia), Nordic states (by Norway), and CELAC (delivered by El Salvador). Artificial intelligence offers great potential for progress of humankind but use of such applications to develop lethal autonomous weapons systems (LAWS) creates difficult legal, humanitarian and ethical challenges. Need to develop clear legal norms to curb illicit use of tech, especially legal and security threats posed by armed drones posing threats to security of persons and properties. Requires increasing monitoring of armed drones without compromising norms of IHL. (10 October) In coming years, emerging technologies will present new challenges. This is why we value global conversations on lethal autonomous weapons systems. (8 October) Throughout history, warfare has always been closely linked to technological innovation. The potential impact of technological progress, in particular artificial intelligence, on international law and international humanitarian law deserves more attention. Despite the progress achieved during the GGE on LAWS this year, the ethical, political and legal questions posed by autonomous weapons have not yet been sufficiently addressed. It is not acceptable that autonomous systems target and attack without human intervention. In the context of autonomous weapons systems the international community is called upon to act before diplomacy is overtaken by facts. To address undesirable developments in the near future, Austria is proposing a legally binding instrument to ensure human control over critical functions in autonomous weapon systems. Bangladesh remains committed to fulfilling her obligations under the Certain Conventional Weapons Convention (CCW) and its Protocols that she is a party to. We commend the work accomplished by the Group on Governmental Experts (GGE) on Lethal Autonomous Weapons System (LAWS), culminating in the consensus adoption of its Reports, including the Possible Guiding Principles. We look forward to discussions in the next meeting of the High Contracting Parties on emerging issues in the context of the objectives and purposes of the Convention. Botswana reaffirms its support for the work of the 5th Review Conference to the “Convention on Prohibitions or Restrictions on the Use of Certain Conventional Weapons” (CCW). In this connection, we welcome the appointment of a Group of Governmental Expert who will amongst others examine challenges related to emerging technologies in the area of Lethal Autonomous Weapons Systems (LAWS). While some nations may promote and even see value in the use of such weapons, we are convinced that such critical decisions involving use of weapons of war and taking of human lives should not be abdicated to machines which ordinarily do not have any regard to international humanitarian law or human rights law. (10 October) Brazil, Austria and Chile have proposed a mandate for the CCW to establish a legally binding positive obligation with regard to human control of autonomous weapons systems. (29 October) The CCW plays central role with its wide membership and flexible framework. Brazil is concerned at the emergence of new threats, including those posed by lethal autonomous weapons systems. Together with Austria and Chile, Brazil has proposed mandate for CCW to establish legally binding obligation to outlaw any weapon system that lacks human control. We welcome the CCW to raise awareness. Autonomous weapons systems pose another challenge that merits an international response, and Bulgaria welcomes the progress made by the Group of Governmental Experts (GGE) on the guiding principles of autonomous weapons systems. Human beings must always remain in control of weapon systems. (17 October) Canada has also been pleased by the discussions on lethal autonomous weapons which we believe are moving ahead at a reasonable pace and in a constructive manner through the CCW GGE process ably steered by India. (25 October) As a precursor to these agreements, the Convention on Certain Conventional Weapons remains at the intersection between conventional weapons and International Humanitarian Law, including its current work on Lethal Autonomous Weapons Systems. Lethal autonomous weapons systems and the development of artificial intelligence are linked to the issue of human responsibility for the use of force, as well as the advances experienced in the capabilities of Unmanned Aerial Vehicles, are generating complex situations in relation to with international law applicable to the use of force, as well as serious challenges to international humanitarian law and human rights. For this reason, and as the Secretary General put it, we must remain vigilant to the emergence of new weapons technologies that could endanger the security of future generations and the possible challenges that can represent the existing legal, humanitarian and ethical norms. Therefore, we agree that we must strengthen a culture of responsibility and adherence to norms, rules and principles. (10 October) With the rapid development of artificial intelligence (AI), destructive effects caused by the combination of the WMD and AI are of great concern. Old mentality and methods are no longer fit for dealing with emerging threats and the governance of new frontiers. They call for necessary regulations of the military application of such technologies under new international rules and norms developed through negotiations. The most dangerous challenge is the tangible deterioration in the security environment internationally and regionally. Especially that some great powers have denunciated their commitment to the international multilateral regime ushering for a new phase of armed race as exemplified in the development of nuclear arsenals and the means of delivering nuclear weapons and this race to possess and develop modern means for cyber hacking and the armament of the outer space as well as relying on increasingly autonomous weapons. legally binding instrument that allows its control, and that guarantee the respect of human rights and the welfare of human beings. Estonia supports the efforts to universalize and strengthen the Convention on Certain Conventional Weapons (CCW). Regarding the Emerging Technologies in the Area of Lethal Autonomous Weapons Systems, we are convinced that the CCW is the most appropriate forum of discussion. Estonia actively contributed to the work of the Group of Governmental Experts (GGE) and we welcome the agreed Guiding Principles and renewing the current mandate of the GGE for 2019. On LAWS, the GGE discussions were useful, bringing us closer to understanding risks and benefits. Any weapon system must be only used in accordance with international humanitarian law. On this consensus, it should be further developed. But LAWS should not be banned if characteristics have not been agreed upon. The Convention on certain classical weapons is unique in the multilateral landscape because it brings together complementary expertise, be it political, legal, military, or diplomatic. This specificity of the CCW is a guarantee of the Convention’s ability to address current and future challenges. The fact that CCW States Parties are dealing with the issue of lethal autonomous weapons systems, as proposed by France in 2013, is a significant development with regard to the Convention. France is pleased that the works of the GGE relating to these future systems continue, and, together with Germany, has formulated substantive proposals which contribute to the GGE’s work, notably the project to negotiate a non-legally binding political declaration. France is pleased to see the wide support among States to this proposal and wishes to go forward in that regard in the meetings to come. (9 October) Another subject of increasing importance are Lethal autonomous weapons systems. Important progress has been achieved this year thanks to the substantive discussions the Group of Governmental Experts on LAWS. However we urgently need to find common ground for effectively addressing the policy challenges raised by autonomy in weapons systems. Germany and France suggest adopting a Political Declaration as a first step to commit states to the principle of human control over future lethal weapons systems and to ensure they are in full compliance with international law. (11 October) New tech, including artificial intelligence, cannot be ignored. The CCW forum must address this issue, particularly via an instrument that bans lethal autonomous weapons. (29 October) The development of lethal autonomous weapons is dangerous if they are not human controlled. (11 October) [At 2:15] The CCW has served as an important and useful instrument. India had the privilege to chair the GGE on LAWS for two years, which has successfully adopted reports by consensus including the process of guiding principles. (26 October) We are pleased that the 2018 session of the GGE on LAWS, under the chairmanship of India, was successful in adopting its report by consensus, including the Emerging Commonalities, Conclusions and Recommendations. The Possible Guiding Principles reiterate that IHL continues to apply fully to all weapons systems, including the potential development and use of lethal autonomous weapons systems. We remain convinced that the CCW is the relevant forum to address this issue, not least because of the fine balance the Convention seeks to strike between humanitarian concerns and military necessity but also because it provides a dynamic and adaptive platform bringing together multiple stake-holders. Further, we believe that addressing this issue within the framework of the CCW strengthens the Convention and underlines that it is capable of responding meaningfully to evolving new technologies applicable to armed conflict in the 21st century. We support continuation of the GGE on LAWS, adequate financial resources and the participation of all stakeholders for taking forward this important subject within the CCW context. (10 October) The question of the UN’ s need to respond to technological advances is not a new one. We saw the dawn of the atomic age just days after the signature of the Charter. Now, as then, we must keep our eyes firmly on the future of weapons technology. 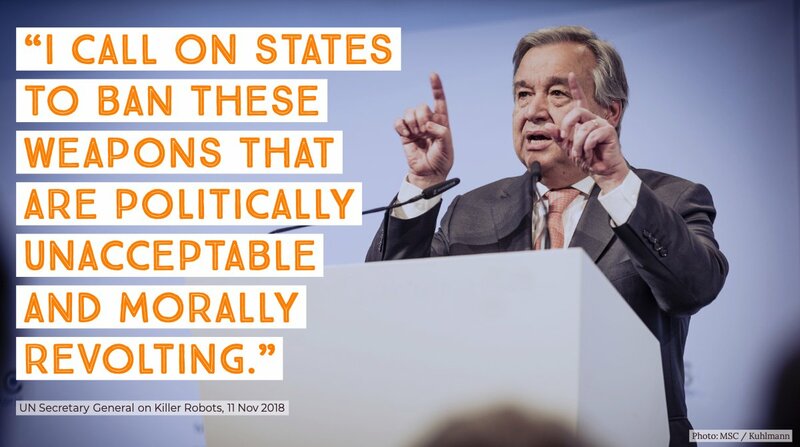 As the Secretary General highlighted when he opened this year’s High Level Week, “The prospect of machines with the discretion and power to take human life is morally repugnant”. Autonomous Weapons Systems pose considerable moral, legal and ethical dilemmas which require careful and sustained consideration. It is our firm belief that such weapons must always remain under meaningful human control, and that only human accountability can ensure full compliance with International Humanitarian Law. Going forward, we will work with other states to find a way to comprehensively address these challenges and ensure humans retain control over the use of force in matters of life and death. (29 October) We must always be conscious of the potential risks posed by new weapon technologies, such as Lethal Autonomous Weapons (LAWS), which present a variety of challenges, from legal to security to ethical. We are encouraged by the progress made during the 2018 meetings of the Group of Governmental Experts (GGE) on LAWS, most notably on the agreed emerging guiding principles which reaffirm that international law applies to autonomous weapon systems and that any future weapons must remain under human control. it is our firm belief that such weapons must always remain under human control, and that only human accountability can ensure full compliance with International Humanitarian Law. Much work remains to be done in fulfilment of our agreed GGE mandate. The inability to date to converge on an agreed working definition or characterisation of LAWS should not hamper our efforts to comprehensively address the challenges posed by LAWS. The fast-pace of current technological developments present a compelling incentive for us to accelerate our efforts next year. In Israel’s view, the fact that the Convention on Certain Conventional Weapons strives to strike the necessary balance between military necessity and humanitarian considerations in the application of International Humanitarian Law, makes it an important instrument in the conventional field. It is also an appropriate forum for discussing many challenges in this sphere. Israel values very much its principles and finds the discussions on Lethal Autonomous Weapons Systems (LAWS), Mines Other than AntiPersonal Mines (MOTAPM) and Improvised Explosive Devises (IED’s), important for better understanding the challenges that lie before us. In regards to the GGE meetings on LAWS, we would like to express our gratitude to Ambassador Amandeep Singh-Gill of India for his leadership. We found the deliberations fruitful. It is clear that there is a need for more understanding of what lies ahead and therefore an agreement to continue the current discussion mandate is important, especially when we talk about future potential technologies. Italy commends the in-depth work carried out by the GGE on LAWS and its substantive outcome. We share the principles, on which the Group identified strong convergence, that International Humanitarian Law must apply to all weapons systems, and that any existing or future weapon system must be subject to human control, particularly in relation to the ultimate decision to use lethal force. We support the renewal of the GGE mandate for 2019, with a view to paving the way towards a consensual Political Declaration. Much has been discussed about LAWS in the framework of the CCW. Japan believes that a technical approach where humans engage in designing, and a human approach, where humans directly engage in operation both have pros and cons, and we need to find the best combination of the two in further discussions. In this regard, we look forward to our discussion in the CCW Annual Conferences next month in Geneva. We also supported the creation of Group of Governmental Experts on lethal autonomous weapons systems (GGE LAWS). We believe that it was a turning point in the discussion to give to this issue more formal approach. We believe that the added value of the GGE could be finding ways for common understandings and definitions of the LAWS. The danger of the consequences of the development of new technologies, which always have a dual-use purpose, is better to be overestimated than underestimated. Leaders of many states and leadership of international organizations are aware about influence of Artificial Intelligence on the future of countries and the entire world. The need for preparation and adoption of certain forms of regulation for the LAWS sphere seems to be obvious and should be followed from designing and production to their practical implementation. At the same time, it is obvious that machines should not be permitted to make decisions to target or kill humans. It is clear that discussion concerning LAWS is just beginning and further work is required to help shape our understanding of this future technology. Kazakhstan believes that that it is important to continue discussions in 2019. A number of technical developments clearly point to a need for new legal obligations, in particular in the area of lethal autonomous weapon systems. Liechtenstein supports efforts to establish binding standards to ensure a human component in the decision-making processes of such systems. The principled resistance of very few States should not prevent the large majority from establishing and benefitting from new standards in this area – as it did not on many other important disarmament questions in the past. Liechtenstein looks forward to stronger collective action in this area. We recognize that the Secretary General has dedicated a section of his Agenda for Disarmament to the challenges of new technologies in the field of international security. The responsible innovation in science and technology must be exclusively destined for peaceful purposes. However, we must remain vigilant to the technological and scientific advances that could diversify and create new methods of war, generate asymmetries by increasing the capacity and military power of a few states and accommodate non-state actors in a new arms race. Therefore, it is necessary to discuss the legal, technical and ethical aspects of the application of new technologies that result in a legally binding instrument to prohibit autonomous weapons systems, as well as the regulation of armed drones. Technology has been a powerful agent of change and transformation. At the same time, human control over new and automated technology has become even more important for international peace and security. Weaponization of drones, 3-D printers, artificial intelligence, automated robots and cyberspace poses serious threat to humanity. Misuse of technological advancement is bound to raise serious ethical and moral questions. It calls for a sound regulatory framework at national and international level and the need for promoting responsible behaviour among States and Non-State actors. (12 October) The Netherlands welcomes the progress made during the 2018 meetings of the GGE on Lethal Autonomous Weapons Systems, in particular the adoption of ten guiding principles. The topic is multifaceted and complex, which is exactly why multilateral discussions on this topic are needed, in order to arrive at a better understanding and to contribute to norm building. The Netherlands is, as before, ready to contribute to these discussions. [Promoting the international rules-based order] As part of promoting the international rules-based order, the Netherlands supports efforts to strengthen the effectiveness and legitimacy of multilateral organisations and international institutions. High grade technologies can create security risks if fallen into the wrong hands. (26 October) We welcome the progress made in the Group of Governmental Experts on Lethal Autonomous Weapon Systems. It provides a good basis for further structured discussions on this multifaceted and complex topic. Increased autonomy in weapons systems could lead to humanitarian benefits, but there are also risks. One thing is certain, there is no simple solution to address those risks. Therefore the Netherlands remains committed to further increase our shared understanding in order to address those risks and will, as before, actively participate in the discussions. We look forward to continue these and other discussions during the meeting of high contracting parties to the Convention on Certain Conventional Weapons this November. New Zealand has participated actively in the Group of Governmental Experts on Lethal Autonomous Weapons Systems and remains concerned about the challenges posed by such weapons to international law and to international humanitarian law in particular. As we elaborated during the GGE, New Zealand remains open to all options currently on the table and does not view them as mutually exclusive. We look forward to next year’s GGE providing for more focused discussions -and decisions – on these options. (9 October) Nine, bringing Cyber Weapons and Autonomous Weapon under appropriate international regulations and prohibitions. (29 October) Pakistan is a party to the Convention on Certain Conventional Weapons (CCW) and all of its five Protocols, and remains fully compliant with their provisions. Pakistan presided over the 5th Review Conference of the CCW in 2016 which took important decisions for dealing with several substantive contemporary issues, including on the very important issue of Lethal Autonomous Weapon Systems, or LAWS. We hope that further consideration of the issue of LAWS in the CCW context would be result-oriented and lead to a legally binding instrument stipulating appropriate regulations on LAWS. We recognize the general concern of the international community, as well as civil society, academic sector and, even, industry, regarding the humanitarian impact that may or may not result from the use of lethal autonomous weapons systems (LAWS). In that sense, we recognize the urgent need to define what are lethal autonomous weapons systems and identify their characteristics as a starting point for the establishment of an international process, ultimately directed at prohibiting development, use and transfer of those systems that do not require absolute control of a human for its operation. Peru supports the work of the open-ended Group of Governmental Experts on lethal autonomous weapons systems established in the framework of the Convention on Certain Conventional Weapons and expects that it will lead to the development of a legally binding instrument and effective on the matter. We strongly reaffirm the imperative need that all employment of these weapons systems is strictly adjusted to the principles and rules of international humanitarian law and human rights law, in particular the principle of non-discrimination and the principle of proportionality of attacks. RECONOCEMOS LA PREOCUPACION GENERAL DE LA COMUNIDAD INTERNACIONAL, ASl COMO DE LA SOCIEDAD CML, EL SECTOR ACADEMICO E, INCLUSO, LA INDUSTRIA, CON RESPECTO AL IMPACTO HUMANITARIO QUE PODRiA 0 PUEDA TENER EL EMPLEO DE LOS SISTEMAS DE ARMAS AUTONOMAS LETALES (SAAL). EN ESE SENTIDO, RECONOCEMOS LA URGENTE NECESIDAD DE DEFINIR QUE SON LOS SISTEMAS DE ARMAS AUTONOMAS LETALES Y DE IDENTIFICAR SUS CARACTERISTICAS COMO PUNTO DE PARTIDA PARA ENTABLAR UN PROCESO INTERNACIONAL, DIRIGIDO EVENTUALMENTE A PROHIBIR EL DESARROLLO, EMPLEO Y TRANSFERENCIA DE AQUELLOS SISTEMAS QUE NO REQUIERAN EN LO ABSOLUTO DEL CONTROL DE UNA PERSONA PARA SU FUNCIONAMIENTO. EL PERU APOYA LOS TRABAJOS DEL GRUPO DE EXPERTOS GUBERNAMENTALES DE COMPOSICION ABIERTA (GGE) SOBRE LOS SISTEMAS DE ARMAS AUTONOMAS LETALES, ESTABLECIDO EN EL MARCO DE LA CONVENCION SOBRE CIERTAS ARMAS CONVENCIONALES Y ESPERA QUE EL MISMO CONDUZCA AL DESARROLLO DE UN INSTRUMENTO JURIDICAMENTE VINCULANTE Y EFECTIVO SOBRE LA MATERIA. We express our continued support for important work conducted within the framework of the Convention on Certain Conventional Weapons (CCW). Poland firmly believes that this Convention remains the most appropriate forum to examine new developments in weapons technologies. We appreciate the work carried forward in 2018 by the Group of Governmental Experts (GGE) on lethal autonomous weapons systems (LAWS) which should lead to identifying constitutive elements of LAWS. Portugal also supports the universalization and strengthening of the Convention on Certain Conventional Weapons (CCW). On new and emerging threats, such as armed drones and lethal autonomous weapons systems, we should reaffirm that international law also applies to those weapons and that future weapons systems must remain under human control. We underline that all States share the responsibility to ensure that their weapons systems comply with international law, in particular international humanitarian law. The Republic of Korea attaches great importance to the Convention on Certain Conventional Weapons (CCW) as an effective platform to address humanitarian concerns while taking into account legitimate security needs as well as military necessities. … We also welcome the recent adoption of the report of the Group of Governmental Experts in the area of lethal autonomous weapons systems (LAWS) which is another meaningful outcome of the CCW process this year. My delegation hopes that we can draw on this year’s achievement and further deepen our understanding on outstanding issues next year, including the human-machine interactions related aspects, within the framework of the GGE. Concerned with growth of new weapon technologies and stresses necessity for human control over all autonomous weapon systems. South Africa reaffirms its commitment to the Certain Convention on Conventional Weapons (CCW) and the humanitarian principles enshrined in this convention.South Africa also reaffirms its support for work of the open-ended Group of Governmental Experts (GGW) to discuss emerging technologies in the areas of lethal autonomous weapons systems (LAWS). (29 October) The Convention on Certain Conventional Weapons and all its protocols are equally relevant humanitarian instruments. [Original – La Convención sobre Ciertas Armas Convencionales y todos sus protocolos son instrumentos humanitarios igualmente relevantes. … The Group of Governmental Experts on Lethal Autonomous Weapons Systems meeting in Geneva has managed to establish positive bases to continue advancing, but it would be necessary to consolidate the added value of these debates in a practical and realistic to promote full respect for International Humanitarian Law. We support a political declaration and a possible code of conduct that includes measures of transparency, confidence-building and exchange of information and best practices, including possible advances in science and technology in the field of artificial intelligence. During 2018, constructive discussions have been conducted in the Group of Governmental Experts on the complex issue of lethal autonomous weapons system, or LAWS. These will need to continue, hopefully in a non-divisive manner and within the framework of existing international law, including international humanitarian law. Switzerland welcomes the results of the 2018 CCW GGE on lethal autonomous weapon systems, notably the Emerging commonalities, conclusions and recommendations contained in the GGE report, which affirmed that IHL continues to apply fully to all weapon systems, that human responsibility must be retained and that legal weapon reviews must be conducted. This corresponds fully to the Compliance-based approach Switzerland put forward. Without preempting what may constitute an appropriate regulatory response, Switzerland supports the idea of developing a political declaration, which would enshrine key principles, give direction to future discussions in the CCW and pave the way for possible practical measures. We have consistently heard from colleagues in the Committee that new technologies, including drones and other lethal autonomous weapons (LAWs), have wide and understudied implications. Thailand could not agree more and we reiterate that in our growing understanding of these new technologies, we have to underscore the importance of respecting and evolving international humanitarian law. On-going discussions on new technologies and weapons should be based on codifying current practices and ensuring progressive development in appropriate international fora. [At 37:40] With regard to autonomous weapons, Tunisia appeals to the regulation of the use of artificial intelligence for military purposes and we hope the appropriate measures will be taken to avoid militarization and an arms race in outer space. The Convention on Certain Conventional Weapons (CCW) is an indispensable part of the international law on “conventional weapons with indiscriminate effects.” … Issues such as Improvised Explosive Devices (IEDs) and Lethal Autonomous Weapons Systems (LAWS) continue to be important. The UK remains fully committed to the Convention on Certain Conventional Weapons. … The UK welcomes the progress made this year by the CCW Group of Governmental Experts on Lethal Autonomous Weapons Systems. We support continuing the GGE’s current mandate into 2019. We continue to oppose a legal instrument or ban that would prejudice legitimate technological advances. We look forward to further work through the GGE on Guiding Principles and the role of existing processes, structures, industry standards and national and international legal frameworks. The EU welcomes the progress made during the 2018 meetings of the open-ended Group of Governmental Experts on Lethal Autonomous Weapons Systems (GGE LAWS), notably the agreed Guiding Principles to reaffirm that international law also applies to autonomous weapons systems and that also future weapons systems need to remain under human control. We emphasise that all States have the responsibility to ensure that their current and emerging weapons systems comply with the requirements of international law, in particular IHL. Human beings must make the decisions with the regard to the use of lethal force, maintain control over lethal weapons systems they use, and remain responsible and accountable for decisions over life and death. We recall that the UN Secretary-General has pointed out to the need to address the fast-paced scientific and technological developments which, in addition to benefits, can entail risks and threats for our collective security. We concur with his view and underline that responsible innovation and Article 36 legal weapons reviews are important. The EU supports the continuation of the GGE’s work in 2019 within the framework of the CCW and we look forward to further substantive recommendations including options for discussions on an outcome document. NAM is of the view that Lethal Autonomous Weapon Systems (LAWS) raise a number of ethical, legal, moral and technical, as well as international peace and security related questions which should be thoroughly deliberated and examined in the context of conformity to international law including international humanitarian law and international human rights law. NAM States Parties to CCW support the establishment of an open ended Group of Governmental Experts (GGE) related to emerging technologies in the area of Lethal Autonomous Weapons Systems in the context of the objectives and purposes of the Convention. The Nordic countries will make a joint statement in the thematic debate on conventional weapons, and will therefore limit our comments here to the following: We welcome the ongoing substantive discussions on new and rapidly evolving technologies, including lethal autonomous weapons systems. Campaign to Stop Killer Robots statement, side event flyer, briefing book entry, list of states calling for a ban.